We will setup your account after we have received payment and we and/or our payment partner(s) have screened the order(s) in case of fraud. It is your responsibility to provide us with an email address which is not @ the domain(s) you are signing up under. If there is ever an abuse issue or we need to contact you, the primary email address on file will be used for this purpose. It is your responsibility to ensure the email address on file is current or up to date at all times. If you have a domain name registered with StableHost, it is your responsibility to ensure that the contact information for your domain account and your actual domain name(s) is correct and up-to-date. StableHost is not responsible for a lapsed registration due to outdated contact information being associated with the domain. If you need to verify or change this information, you should contact our sales team via email. Providing false contact information of any kind may result in the termination of your account. In dedicated server purchases or high risk transactions, it will be necessary to provide government issued identification and possibly a scan of the credit card used for the purchase. If you fail to meet these requirements, the order may be considered fraudulent in nature and be denied. The free transfer services are available for 30 days from your sign up date and only available if your previous hosting company is running cPanel. If your previous company was running a non-standard control panel, there could be a migration fee. Transfers outside of the 30 day free period will incur a charge; please contact a member of the transfers department with specific details to receive a price quote. All services provided by StableHost may only be used for lawful purposes. The laws of the State of Florida and The United States of America apply. If you are hosting in our our Europe or Asia division, the local laws of that location also apply. The customer agrees to indemnify and hold harmless StableHost from any claims resulting from the use of our services. Use of our services to infringe upon any copyright or trademark is prohibited. This includes but is not limited to unauthorized copying of music, books, photographs, or any other copyrighted work. The offer of sale of any counterfeit merchandise of a trademark holder will result in the immediate termination of your account. Any account found to be in violation of anothers copyright will be expeditiously removed, or access to the material disabled. Any account found to be in repeated violation of copyright laws will be charged an administrative fee and can result in termination of your account.. If you believe that your copyright or trademark is being infringed upon, please email dmca@stablehost.com with a valid DMCA request. If the request is of a licensing issue, we may require further documentation. StableHost services, including all related equipment, networks and network devices are provided only for authorized customer use. StableHost systems may be monitored for all lawful purposes, including to ensure that use is authorized, for management of the system, to facilitate protection against unauthorized access, and to verify security procedures, survivability, and operational security. During monitoring, information may be examined, recorded, copied and used for authorized purposes. Use of StableHost system(s) constitutes consent to monitoring for these purposes. Any account found connecting to a third party network or system without authorization from the third party is subject to suspension. Access to networks or systems outside of your direct control must be with expressed written consent from the third party. StableHost may, at its discretion, request and require documentation to prove access to a third party network or system is authorized. Sites hosted on StableHost's service(s) are regulated only by U.S. law. Given this fact, and pursuant to Section 230(c) of the Communications Decency Act, we do not remove allegedly defamatory material from domains hosted on our service(s). The only exception to this rule is if the material has been found to be defamatory by a court, as evidenced by a court order. StableHost.com is not in a position to investigate and validate or invalidate the veracity of individual defamation claims, which is why we rely on the legal system and courts to determine whether or not material is indeed considered defamatory. In any case in which a court order indicates material is defamatory, libelous, or slanderous in nature; we will disable access to the material. Similarly, in any case in which a US Court has placed an injunction against specified content or material; we will comply and remove or disable access to the material in question. The language of Section 230(c) of the Communications Decency Act fundamentally states that Internet services providers like StableHost and many of StableHost's other webhosting services and brands are re-publishers and not the publisher of content. Our service merely provides a hosting platform and space on which to host content, and any creation or publication of content on our services is the sole responsibility of the third-party user which creates or publishes the content. Therefore, StableHost should not be held liable for any allegedly defamatory, offensive or harassing content published on sites hosted under StableHost's webhosting service(s). If in doubt regarding the acceptability of your site or service, please contact us at abuse@stablehost.com and we will be happy to assist you. Bulk email will only be allowed on our VPS platform and must abid by all US laws regarding spam, including the CAN-SPAM act. StableHost reserves the right to require changes or disable as necessary any web site, account, database, or other component that does not comply with its established policies, or to make any such modifications in an emergency at its sole discretion. StableHost reserves the right to charge the holder of the account used to send any unsolicited e-mail a clean up fee or any charges incurred for blacklist removal. This cost of the clean up fee is entirely at the discretion of StableHost. You agree to supply appropriate payment for the services received from StableHost, in advance of the time period during which such services are provided. You agree that until and unless you notify StableHost of your desire to cancel any or all services received, those services will be billed on a recurring basis. As a client of StableHost, it is your responsibility to ensure that your payment information is up to date, and that all invoices are paid on time. You agree that until and unless you notify StableHost of your desire to cancel any or all services received (by the proper means listed in the appropriate section of the Terms of Service), those services will be billed on a recurring basis, unless otherwise stated in writing by StableHost. StableHost reserves the right to bill your credit card or billing information on file with us. StableHost provides a 9 day grace period from the time the invoice is generated and when it must be paid. Any invoice that is outstanding for 9 days and not paid will result in a $2.00 late fee and/or an account suspension until account balance has been paid in full. The $2.00 late fee is applied in addition to whatever else is owed to StableHost for services rendered. Access to the account will not be restored until payment has been received. If the customer has multiple services, they risk having their other services suspended until all services are paid up to date. StableHost reserves the right to change the monthly payment amount and any other charges at anytime. Any chargebacks against StableHost will occur a $150 chargeback fee. Your use of this service is at your sole risk. This service is provided to you as a courtesy. StableHost is not responsible for files and/or data residing on your account. You agree to take full responsibility for files and data transferred and to maintain all appropriate backup of files and data stored on StableHost servers. You can generate your own backups via the cPanel interface. StableHost reserves the right to cancel, suspend, or otherwise restrict access to the account at any time with or without notice. StableHost gives you a 45 day money back guarantee on managed shared hosting and reseller solutions. Dedicated (VPS) servers have a 7 day money back guarantee. There are no refunds on dedicated (VPS) servers, administrative fees, addons such as dedicated IPs, install fees for custom software, or domain name purchases. After the initial 45 days, no refunds will be issued. Use 75% or more of your max system resources for longer then 90 seconds. There are numerous activities that could cause such problems; these include: CGI scripts, FTP, PHP scripts, HTTP, etc. Store any multimedia larger than 250MB per video on your account. Share your account with your friends and family members. Your account is for your websites only. If your shared / reseller server has a physical downtime that is not within the 99.9% uptime you may receive one month of credit on your account. Approval of the credit is at the discretion of StableHost dependent upon justification provided. Third party monitoring service reports may not be used for justification due to a variety of factors including the monitor's network capacity/transit availability. The uptime of the server is defined as the reported uptime from the operating system and the Apache Web Server which may differ from the uptime reported by other individual services. To request a credit, please contact billing@stablehost.com with justification. All requests must be made in writing via email. Uptime guarantees only apply to shared / reseller solutions. Resellers are responsible for supporting their clients. StableHost does not provide support to our Reseller's Clients. If a reseller's client contacts us, we reserve the right to place the client account on hold until the reseller can assume their responsibility for their client. All support requests must be made by the reseller on their clients' behalf for security purposes. Resellers are also responsible for all content stored or transmitted under their reseller account and the actions of their clients'. StableHost will hold any reseller responsible for any of their clients actions that violate the law or the terms of service. By using any StableHost services, you agree to submit to binding arbitration. If any disputes or claims arise against StableHost or its subsidiaries, such disputes will be handled by an arbitrator of StableHost's choice. An arbitrator from the American Arbitration Association or the National Arbitration Forum will be selected in the state of Florida. Arbitrators shall be attorneys or retired judges and shall be selected pursuant to the applicable rules. All decisions rendered by the arbitrator will be binding and final. The arbitrator's award is final and binding on all parties. The Federal Arbitration Act, and not any state arbitration law, governs all arbitration under this Arbitration Clause. You are also responsible for any and all costs related to such arbitration. StableHost shall not be responsible for any damages your business may suffer. StableHost makes no warranties of any kind, expressed or implied for services we provide. StableHost disclaims any warranty or merchantability or fitness for a particular purpose. This includes loss of data resulting from delays, no deliveries, wrong delivery, and any and all service interruptions caused by StableHost and its employees. Information provided by Customer when registering with StableHost will use in the form of an internal customer register. Personal data are covered. 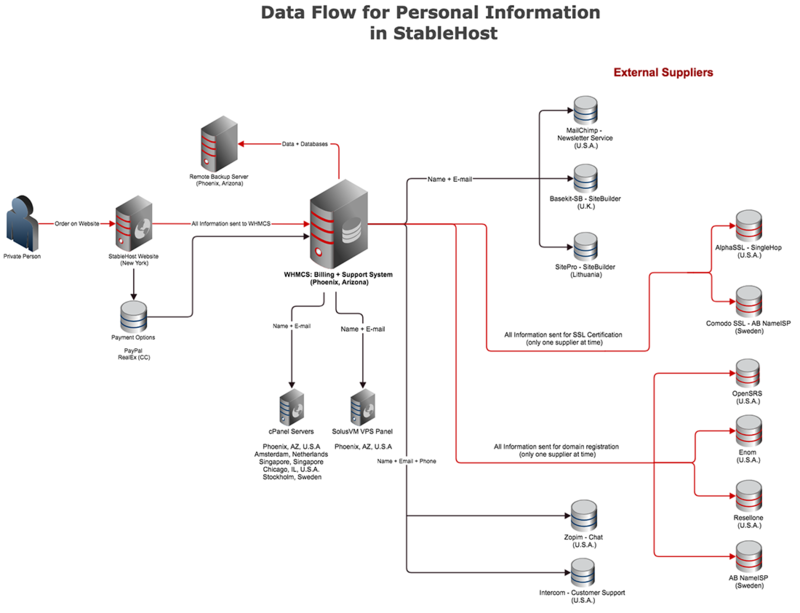 Customer hereby agrees that StableHost uses this information in communication between the parties in the flow chart, see Appendix 1. In case the current information provided by customer is incorrect and StableHost has access to correct contact information, StableHost has a right and an obligation to adjust current information. In case Customer has more than one user account / username at StableHost, StableHost has a right and an obligation to merge Customer's different accounts into one for administrative purposes. An administrative fee may apply. The Customer acknowledges that Personal Data provided for registration of domain names will be publicly accessible via the Internet at the appropriate Registration Unit chosen by StableHost. If customer chooses not to use "Whois Privacy", the following information will be accessible: Name, Email Address, and Domain Name. For example: If the customer registers a .com domain, personal data will be present / processed at both StableHost and the registry holder, which in this case is .com. It is the Customer's obligation to inform affected persons in their organization of the above and to hold an authorization to handle Personal Data in the manner specified above. StableHost will, upon request, only disclose personal data to the authorities rather registry. Handling of personal data. The red thread on Apendix 1 indicates where complete personal data is sent. For questions regarding personal data, refer to StableHost support. StableHost may disclose any subscriber information to law enforcement agencies without further consent or notification to the subscriber upon lawful request from such agencies. We will cooperate fully with law enforcement agencies. StableHost reserves the right to revise its policies at any time without notice.